In livestock, aggression may lead to difficulties in handling and decreased animal well-being. 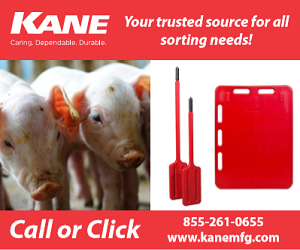 Pigs selected for lean growth are thought by producers to be more difficult to handle. Previous studies have shown that leaner terminal cross pigs exhibit higher levels of aggression than maternal lines of pigs. Human studies suggest that there is a relationship between peripheral whole blood serotonin (WBS) and violence in men. In this study, a possible relationship between leanness and WBS was investigated in weanling pigs. One problem with comparing pigs from differing type of crosses is they have a large number of genetic differences that may result in spurious correlations. 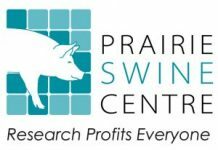 A better experimental design is to compare pigs that come from a common genetic background that have been selected for increased leanness. Daryl Kuhlers of Auburn University has selected a line of Landrace for increased loin eye area. After six generations, the select line differs from the control line by 1.6 square inches. This study examines the behavioral and physiological differences between these two genetic lines of Landrace pigs. At Auburn University, Landrace pigs were selected for increased loin eye area, which measured 1.6 square inches over the control line after six generations. Pigs were received from Daryl Kuhlers at Auburn University, Auburn, AL. Four littermate gilts were penned in wooden chicken crates and transported to the Purdue University Segregated Early Weaning (SEW) facility (approximately 11 hours). Pigs were transferred into nursery pens at the SEW facility. They remained in the same grouping as they were in for transport. Pigs were given continuous access to water and were fed ad libitum. Video recording of pigs began when they arrived at the SEW facility. The 62 Landrace gilts (30 lean and 32 control pigs) were housed in two groups based on age (first group: 11 lean, 20 control; second group: 19 lean, 12 control) and randomly blocked for location in the nursery. Blood samples were obtained by jugular venapuncture at three time points (age at first bleed 24.05 ± 1.67 days; second bleed 34.55 ± 1.54 days; third bleed 44.55 ± 1.54 days) that were determined by days after a significant stressor (10, 20 and 30 days post-transportation and weaning). WBS concentrations were determined using high-performance liquid chromatography (HPLC) methods. WBS concentration (Figure 1) in the lean pigs (170.90 ± 6.95 ug/ml) was significantly higher (P<.0001) than in the control pigs (140.69 ± 6.42 ug/ml). No significant interactions were found between the time point and genetic line (P=.1911), nor between the genetic line and group in nursery (P=.1648). A significant interaction was found between the time point and the group (P=.0001). However, the interaction was discounted because the time pattern was similar for both groups, showing that the difference was a relative change. Our results suggest a relationship between leanness and WBS. This may be related to differences in aggression between these two genotypes, which will be studied to determine the relationship between leanness, serotonin and aggression. Further experimentation is continuing with these lines to study levels of activity, interaction and aggression, as well as physiologic response to handling. In the past, behavior has been overlooked during the selection process. As we develop a more complete understanding of the relationships between growth and behavior, selection techniques can be developed which may result in animals that are better adapted to their growing environment, enhancing their well-being and their ease of management. Figure 1. Differences in serotonin levels between control and select lines.